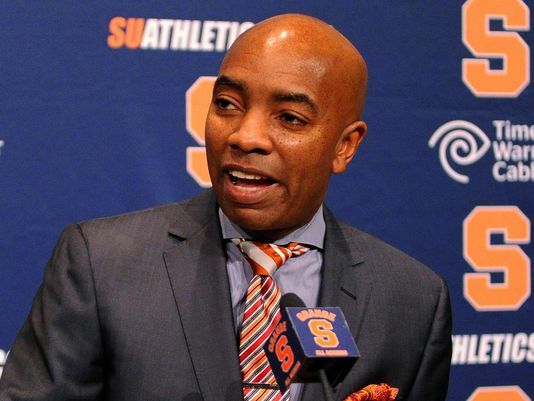 Whether Daryl Gross was pressured by Syracuse University administration to resign as athletic director or be fired remains to be made public. What we do know is Gross resigned today as Syracuse’s AD offered to become Vice President and Special Assistant to the Chancellor, and adjunct professor in the David B. Falk College of Sport and Human Dynamics at the college. Below is his statement regarding his change in roles at the school. “Today, I am announcing that after 10 years of leading the Syracuse University Department of Athletics, I have decided that it is time for me to take on new challenges. I am truly humbled and honored to have served. It has been an amazing 10 years in which we have had some of the best successes and accomplishments in the history of the program and established that our teams are among the elite in the nation across the board, on the field and in the classroom. We are truly proud of the transformational changes most notably our move to the ACC, which has shaped and strengthened our program for years to come. “Now I am excited and grateful to take on a new opportunity, offered to me by Chancellor Syverud, to become Vice President and Special Assistant to the Chancellor, and adjunct professor in the David B. Falk College of Sport and Human Dynamics. My focus will be on marketing, branding and advancement for this great institution, while teaching sports management in this nationally recognized college. “I am thankful to have worked with what I consider the greatest coaching staff in the country and our student-athletes who have competed proudly at the highest national levels. Our vision was to graduate student-athletes and provide them with the tools with which they can make a positive impact on society, and I feel that goal was accomplished. I am also thankful for my wonderful staff who have been exemplary. In addition, I am truly humbled by the amazing support of the Syracuse community. There are no better fans in the world, as proven by the numerous record crowds. “I believe Syracuse athletics is positioned to flourish going forward in the most extraordinary way. Most importantly, we have graduated thousands of student-athletes who have become global leaders. The Syracuse athletics brand is strong and resilient. There had been pressure to fire Gross and Men’s Basketball coach Jim Boeheim after a NCAA public report led to the school vacating 108 wins, receiving a fine of more than $1 million, and a loss of 12 scholarship players over the next four years. As the athletic director, it was Gross’s job to oversee academic eligibility of athletes, drug testing, and marketing opportunities to bring in revenue for the school. One of the main reasons Gross and Boeheim have been under fire was because Gross admitted Syracuse followed an unwritten rule for drug testing between 2001 and 2009 because the written rule was confusing. Well, this confusion led to players testing positive for drugs multiple times being allowed to practice and play in games which is not how the drug testing policy works. There were academic violations as well that made the university look like they valued athletics over academic integrity. Course work was completed for a player by the director of men’s basketball operations and a receptionist to make him eligible again. Revisions to papers or whole assignments were completed by the same receptionist and a tutor. I am sure they both knew what they were doing was wrong and a violation of NCAA rules, but the receptionist and tutor chose to do it anyway. Under Gross’s watch, illegal benefits were provided to two basketball players. Some players were encouraged to develop a relationship with a booster who paid the players over $8000 in cash for volunteering at a local YMCA. In addition, some basketball staff members were also given money by boosters for appearing at the same YMCA. As a result of the aforementioned violations, the NCAA took away three scholarships a year for the next four years, suspended Coach Boeheim for nine ACC games next season, and vacated 108 wins during the years Syracuse violated NCAA rules dropping the Hall of Fame Boeheim from second to sixth on the all-time list of wins for Division 1 basketball coaches. They were also placed on probation for five years. One might say that Boeheim should have been fired as well. I completely agree and wrote about that shortly after these sanctions were levied at Syracuse. However, Boeheim is a legend at Syracuse and the university seems to be willing to let him retire on his terms. Earlier today, Boeheim said he will retire after three more seasons of coaching. I have a hunch the administration may have asked Boeheim how much longer he plans on coaching and that is what led to Boeheim’s statement today about when to give up the reigns to former player and long-time assistant Mike Hopkins. When Gross took over for long-time AD Jake Crouthamel in 2005, there was a great deal of excitement in the air. Gross had arrived from the University of California after serving as senior associate athletic director. He was instrumental in bringing current Seattle Seahawks’ coach Pete Carroll to USC where the football team achieved extraordinary success. Gross was unable to have that same impact on Syracuse’s football team even after he fired Paul Pasqualoni shortly after arriving and replacing him with former NFL coordinator, Greg Robinson. The biggest impact Gross had at Syracuse was in helping the transition from the Big East to the ACC. The move in conferences has netted Syracuse a 17 million dollar profit each of the last two years due to annual television revenue. He has marketed the Syracuse brand by attempting to dress the teams in various Nike uniforms in hopes of gaining further revenue for the school. I am glad to see Gross be retained by the school as Vice-President and Special Assistant to the Chancellor in addition to an adjunct professor. The school administration recognizes he is a very intelligent individual who has helped bring in millions of extra revenue never seen before his arrival. Gross needed to resign from his position as athletic director whether you find him innocent, partially responsible, or fully responsible for the sanctions handed down to Syracuse University and its basketball program. I am sure he will help with the transition to a new athletic director as part of his new role. Whoever the next athletic director is at Syracuse, this individual must possess the same drive and passion as Gross has for Syracuse athletics. Yet, this person must do a better job of overseeing all aspects of athletics for the university. I would ask interviewees to present an entry level plan as to how he/she will ensure these violations do not occur ever again.